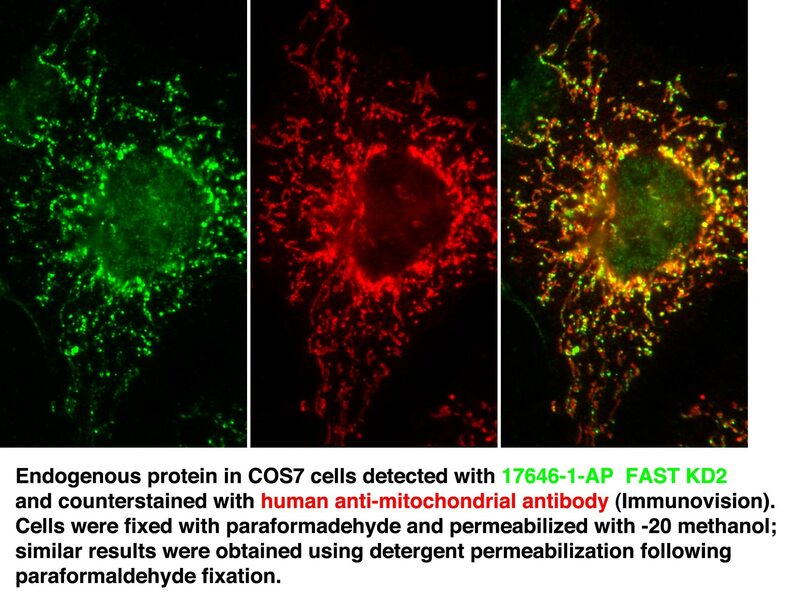 IF result of anti-FASTKD2 (17464-1-AP) with COS7 cells. IP Result of anti-FASTKD2 (IP:17464-1-AP, 4ug; Detection:17464-1-AP 1:300) with mouse heart tissue lysate 4000ug. FASTKD2(FAST kinase domain-containing protein 2) is also named as KIAA0971 and belongs to the FAST kinase family.A potential cleavage site of the 79 kDa FASTKD2 precursor protein by the mitochondrial matrix protease (MMP) is present between M52 and Q53 and predicts the mature imported protein from the FASTKD2 precursor to be composed of 642 amino acid residues for a MW of approximately 73 kDa(PMID: 18771761) and the clinical and MRI findings of the FASTKD2-associated disease are rather unusual for mitochondrial disorders. 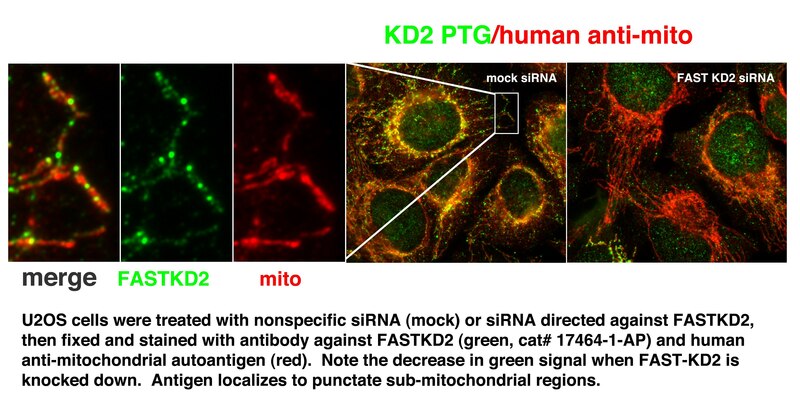 FASTKD2 is an RNA-binding protein required for mitochondrial RNA processing and translation. Mitochondrial RNA Granules Are Centers for Posttranscriptional RNA Processing and Ribosome Biogenesis. A mitochondria-specific isoform of FASTK is present in mitochondrial RNA granules and regulates gene expression and function. Role of FAST kinase domains 3 (FASTKD3) in post-transcriptional regulation of mitochondrial gene expression. A pseudouridine synthase module is essential for mitochondrial protein synthesis and cell viability. The Pseudouridine Synthase RPUSD4 is an essential component of Mitochondrial RNA Granules. 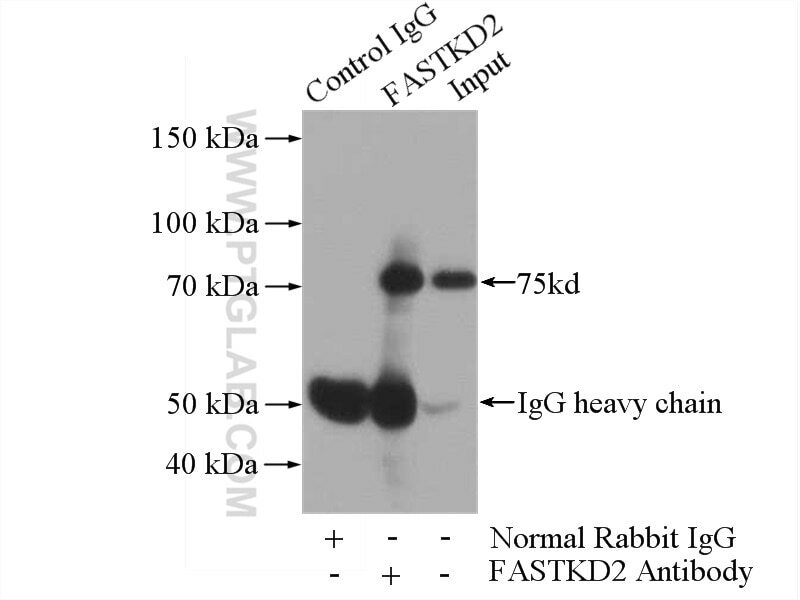 WB result of anti-FASTKD2 (17464-1-AP) with overexpressed protein. 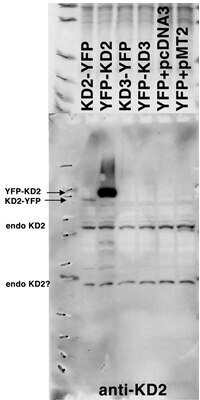 IF result of anti- FASTKD2 (17464-1-AP) with FASTKD2-YFP overexpression in COS7 cells. IF result of anti-FASTKD2 (17464-1-AP) with U2OS cells.